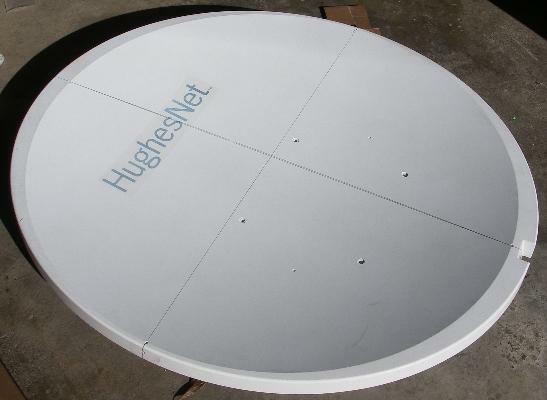 This web page describes my experience installing one of these new Hughes HX50 VSAT terminals in October 2007. Update 14 April 2016: What is discussed here also applies to HX90. In summary: I had no problem putting the dish together or programming the HX50 modem and pointing at the satellite. I powered off and connected the transmit cable, powered on and, without touching anything, ten minutes later it was all working well and I was browsing the internet. On the minimal tariff (nominal up to 500 kbit/s download speed) I get between 355 and 612 kbit/s until I have downloaded 35 Mbytes, things then slow down to 128k and then to 64kbit/s if I get above 40 Mbytes downloaded. It resets to back to zero traffic count and up to fast speed again every 8 hours. I downloaded 150 Mbytes of Microsoft updates and a couple of hours later was back to full speed again. It is more than adequate for my needs, which are web browsing for 1 PC/person and the download of some 20 Mbytes of text server log files every day. Different VSAT tariffs have different maximum speeds and Mbytes allowances. During the assembly and installation I noted several new features, such as the new mode-matched feed horn and the way it needs to be assembled for polarisation setting. I draw attention to these points in the further details below. The HX VSAT terminal arrived in three packages. 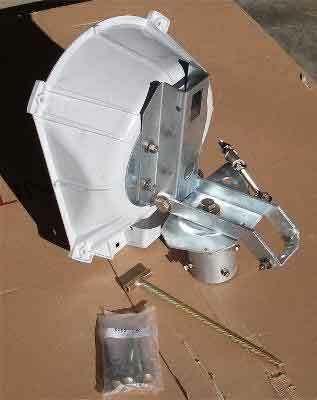 The large square box contained the 1.2m antenna reflector, the long slim box contained the feed support arm and two support struts and the feed horn. The cube shaped box contained the 3 axis antenna positioner and the Hughes HX50 modem and the outdoor 2 watt Ku band radio assembly. Put the modem is a cool dry place, away from direct sunlight and sources of heat. A free flow of cool dry air into the lower vents either side near the base and out via the vents around the top is important. There is a DIN type multi pin low voltage DC cable that goes between the HX50 modem and the power supply module. This low voltage multi-way cable should stay connected to the modem all of the time. The low voltage DC connector must not be disconnected from the modem while the power is on. If you need to cycle the power, this must be done at the AC mains wall switch. The mains AC power supply module has input intended for 100 - 240V 50-60Hz (2.0A max) and output of 6.5V 1.3 A and 19.5V 2.85 A. 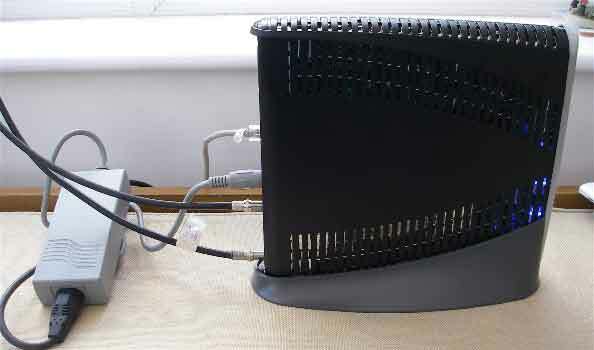 The use of the base, to hold the modem in an upright orientation is mandatory for cooling. The 1.2m antenna reflector has a long F/D ratio to give good cross-polarisation performance. 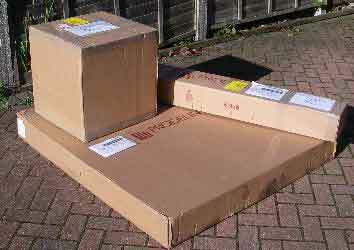 The reflector comes in a large square box marked "Fragile" and it needs to be treated as such. Wash your hands before you hold it. When you remove it take care to lift it and not to scrape the edges. I was rather impressed to see that there were 4 ball rod reference points around the periphery of the curved surface. These show that the designers/manufacturers are taking the dimensional accuracy seriously. I have the impression that this dish is probably good for Ka band operation, provided the reflective metal material under the paint surface is smooth and continuous. I put tight fishing lines across and up and down across the dish. See image. Where the fishing lines crossed in the middle, the lines just touched, with either one on top. This is perfect. I have seen many reflectors with errors of several mm, even straight out of the box. If you ever use a dish with a heavy radio/LNB/BUC amplifier etc do pay attention to the weight and the way it may distort the dish. At 14.5 GHz the rim must be flat to 1.3 mm if possible (1/16th wavelength error at 14.5 GHz). In this case there was 0mm (zero) error as the dish was measured straight out of the box. Brilliant. The front of the dish has been spray painted with a matt white paint which has a hydrophobic effect. After heavy dew the surface is covered in tiny droplets. The "matt" aspect is good since it reduces the heating of the feed and RF assembly when the sun reflects at around the time of sun noise events, which occur on several days in spring and autumn and for a few minutes on each day. Try not to touch the front surface. This comes in a cube cardboard box marked 0800-3455 , containing AZ/EL positioner 1.2m 0.8 F/D. 0185-483 Antenna azimuth-elevation-polarisation 3-axis positioner: The 3-axis positioner is a good design, clearly based on many years of experience. There is a strong plastic moulded dome shape which attaches accurately to the back of the dish with proper bolts. I much prefer this to the giant self tapping screws, as used on some older antennas. Offset angle: The rear of the plastic dome is angled so as to compensate for the offset angle of the dish and to provide a polarisation adjustment plane at right angles to the beam direction. It is possible to place an inclinometer here, against the vertical metal plate, where the two pairs of the 4 polarisation bolts are located. 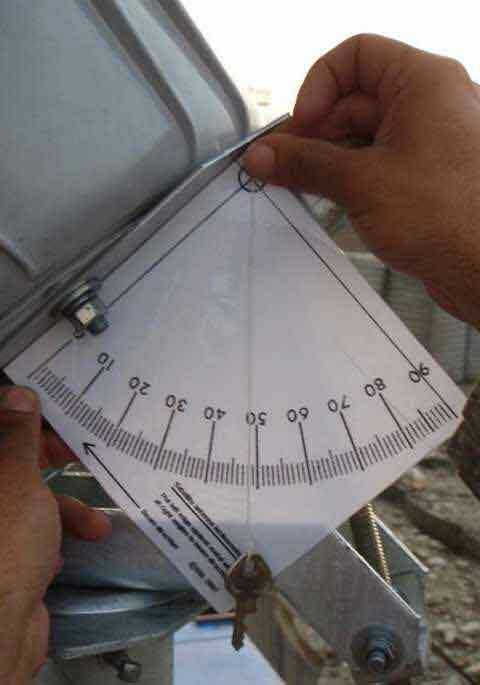 If you don't have an inclinometer then read about setting elevation angle by measurement. The beam elevation angle and beam direction remains unchanged even when the entire dish is turned by up to +/- 90 deg polarisation adjustment. There is an arrow pointer like this < on the rear plate, at the left side, aimed at the polarisation scale. This scale is really good, it is accurate and easy to use and you don't need a magnifying glass to read it! Loosen the four polarisation bolts and rotate the dish to set the required polarisation adjustment angle. Clockwise, while facing towards the satellite, is positive. If you are close to the equator a large polarisation adjustment angle may be required, possibly approaching + or - 90 deg.. This will lead to some strange appearances, as the entire dish may seem to be almost on its side. Don't worry, this is correct. Set the polarisation angle accurately - the scale clearly shows 1 degree intervals. If you are operating with a Eutelsat satellite, add 3.5 deg to the calculated angle before applying it to the polarisation scale. Rear view of the 3-axis positioner, while facing towards the satellite. The polarisation has been adjusted to +30 deg clockwise. The site is north of the equator and the satellite is in a south-westerly direction. Rear view of the 3-axis positioner, you are facing towards the satellite. The polarisation has been adjusted to -20 deg anticlockwise. The site is north of the equator and the satellite is in a south-easterly direction. Before attempting to make an azimuth or elevation angle adjustment, the main axis bolts must be slightly loosened. Some grease on the moving parts won't do any harm, for example between the top of the canister and the rotating plate, and plenty along on the elevation screw. If your intended elevation angle is between 87 and 90 deg (i.e. almost straight up) you may wish to leave out the large flat washer on the main azimuth bolt and also the two outer flat washers on the T bar at the top of the elevation screw. When you are nearing completion of the alignment tighten the very large azimuth axis bolt and then do the final tweaking of the elevation angle last. 0490-662 Elevation screw: The lower end of the elevation screw fits through a U shaped bracket with the two adjuster nuts above or below. There are two possible orientations for the U shaped bracket. Use the lower position normally, so that the outer nut is easily accessible with a spanner, while adjusting the elevation. Use the upper position only if you are operating at a very low elevation angle. If you tighten the main elevation axis bolt, remember to loosen it again if you come back to make a further elevation adjustment. There is no elevation angle scale. Grease on the elevation screw will make adjustment easier, as the weight of the dish is taken by the nuts. 0200-1330 Poly bag hardware kit containing 2 short and 2 long antenna attachment bolts and one larger elevation screw bolt and two big nuts. 4096-662 Instruction manual for 1135 series 1.2m KU RX/TX antenna az/el Eutelsat 3-axis adjuster. The instructions are good. The pipe or pole interface below the 3-axis positioner is the canister which is intended for a vertical pipe, 2.88 inches or 72 mm outside diameter. The minimum height of the top of the pipe is 18 inches above ground level. The pipe should extend 30 inches below ground level into concrete. The bottom end of the pipe needs to be cut diagonally or to have some metal welded on at the side to prevent it rotating in the concrete. Before pouring concrete check you can see the satellite ! You can use a locally purchased pipe. Think about elevation angles and visibility of satellite before buying the pole and pouring the concrete. Alternatively, you may use a non-penetrating mount. If you have a non-penetrating mount follow the assembly instructions carefully. Some designs involve the lower and upper sets of diagonal braces being joined at the pipe in anticlockwise and clockwise directions to prevent slight pole rotation movement. 1. 0200-1342 Hardware kit to attach the main feed arm to the dish, comprising three nuts/bolts/washers for the three attachments to the dish plus one longer bolt to go sideways through the main feed arm, where the side struts attach. There is only one hole across through the main feed arm, so no chance of incorrect assembly! 2. 0200-1323 This is a grey coloured rectangular plastic spacer, flat on top and with a rounded shape underneath to interface between the main support arm and the outdoor RF unit. It comes with two bolts, washers and nuts for attaching to the round tube of main feed arm. 3. 0176-323 (Quantity 2) Two side struts to hold the main feed support arm. Specific to 1.2m diameter dish with 0.8 F/D ratio. The ends of the rods are flattened. The longer ends go to the reflector. 4. 0183-721 39 deg mode matched feed horn and circular waveguide spacer. This feed is described at "ASSY 39 DEG EUTELSAT FD"
The radiation power pattern of the feed must match the F/D ratio (distance from feed to bottom of the dish versus dish diameter) of the dish so that the power from the feed is best distributed across the dish. The power distribution is a compromise, to achieve acceptable gain and sidelobe pattern simultaneously. 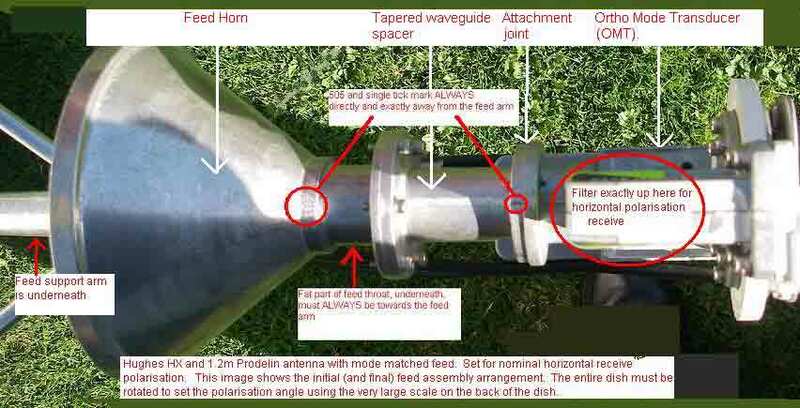 The throat of this feed horn has three internal mode matching slots machined on the inside which cause cross polarisation performance opposite to that generated by the offset-antenna geometry. The net result is superb cross-pol performance of the complete antenna. For this to work properly, the three slots must oriented towards the feed support arm, regardless of the polarisation set. 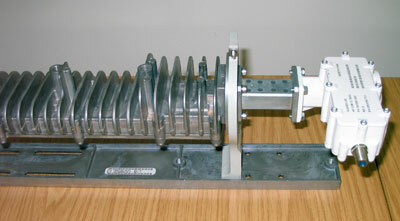 The feed horn comes with a spacer section of tapered circular waveguide, attached to the feed horn at a specific angle. The rear flange rim of the waveguide spacer is marked in two places, at 90 deg to one another, with a single score and a double score marking, 90 degrees apart. The 505 on the feed throat and the single score mark on the rear flange of the spacer must be oriented directly away from the feed arm - regardless of the polarisation required. The feed comes with a yellow sticker saying "Hazards caused by Electromagnetic fields, Keep away 4 feet (1.2m) from this point"
5. 0176-323 Feed support main arm. This an angled, galvanised steel tube which attaches to the lower edge of the dish. Its length is suitable for the 1.2m diameter dish and 0.8 F/D ratio to meet Eutelsat requirements for cross-pol performance. The feed end of the arm is circular tubing, with two bolt holes. 6. 0200-604 Waveguide hardware kit comprising rubber O ring, silicone grease sealant, 6 waveguide screws, washers, and 7/64th inch hex (Allen) key spanner. 7. 4096-689 12 page instruction manual with diagrams for assembling the 1.2m Ku band TX/RX EUTELSAT NEC INTERFACE ANTENNA FEED SYSTEM. These are good instructions and worth reading. But, on page 10 there is reference to a forward yoke which is not used in this instance. If the forward yoke existed it would help make sure that you have fixed the feed horn/spacer so that the single score mark is away from the feed arm, but it provides scope for +/- 7 deg fine adjustment. Earthing / Grounding: Note that the three feed support arms and the outdoor RF unit are not joined by metal to the positioner and mounting pipe behind the dish. This in my opinion is a good thing as it prevents stray earth currents from the antenna location to the modem location travelling via the coax cable. For lightning protection I recommend that a lightning earth (ground) cable/rod be attached to the pipe/positioner and that the two coax cables be earthed as they enter the building, with a co-located large diameter earth cable connection to the building earth. The connection of the coax cable outers and the building earth to a real lightning earth is controversial and possibly hazardous and a qualified electrician should be consulted. In buildings using PME the addition of a new earth cable to the real ground may, under fault conditions, provide a path for a very high current from the local neighbourhood and thin cables alone, such as the coax outer braids, from the modem to the lightning ground are a fire hazard. 2 watt outdoor RF assembly: OMT, LNB, BUC and mounting yoke. The LNB was type INVACOM VSAT LNB&FILTER SPV-3SM with switchable internal reference local oscillator 9.75 or 10.6 GHz for the frequency bands 10.7 - 11.7 GHz (950-1950 MHz in cable) ) or 11.7 - 12.75 GHz (1100 - 2150 MHz in cable). local oscillator switching is done using a 22 kHz tone from the modem, sent up the coax cable. Stability is +/-0.45 MHz and therefore suitable for receiving large bandwidth DVB-S or DVB-S2 type outlink carriers. Attachment of the feed to the OMT requires special attention regarding nominal polarisation setting at the initial assembly. From your service provider determine what is the nominal polarisation you are to receive before your start assembly. This nominal receive polarisation will be called "horizontal" or "vertical". Assemble the Feed to the OMT/BUC for the nominal horizontal polarisation. You later rotate the entire complete dish by 90 deg either way if Vertical name receive polarisation is require. Then apply the polarisation angle adjustment amount. Horizontal nominal receive polarisation is achieved with the single score mark on the spacer flange at the top and the OMT/LNB side arm at the top, away from the feed arm. The polarisation scales on the white BUC yokes read 0 (zero) deg. The image below shows the top view, looking directly downwards. As shown, the transmit polarisation, from the BUC on the left, is vertical. Receive polarisation is Horizontal. Remember to attach the feed horn with the 505 directly away from the feed support arm. With the entire dish rotated so that the feed arm is at the bottom centre you are at a Horizontal receive polarisation starting position. For a Vertical polarisation starting position rotte the entire dish 90 deg, one way or the other. This is a two step process - set to nominal and then apply the adjustment amount (between +/- 90 deg). First set the nominal receive polarisation. If Horizontal, then the feed arm will be central at the bottom, near the ground (set like the picture above). If you want Vertical nominal receive polarisation then turn the whole dish by 90 deg either way, so that the feed arm is directly at one side or the other. If the intended adjustment amount is + positive then there is some preference that the initial 90 deg adjustment is anticlockwise (as viewed from behind the dish). If the intended adjustment amount is - negative then there is some preference that the initial 90 deg adjustment is clockwise (as viewed from behind the dish). Having set the nominal polarisation, apply the adjustment amount. if the amount is + positive then turn the dish by that amount clockwise (as viewed from behind the dish). If you started with the feed arm at the bottom centre then the read the scale directly. If you are starting with he feed arm out at one side then note that it is the amount of adjustment movement that matters. The scale numbers will read backwards from 90, so a 30 deg movement will result in scale reading of 60. The white yoke at the feed end, was attached to the grey metal base plate in focus location = 2. I made a pattern measurement which clearly showed the two first sidelobes so I believe that this focus position is correct. At the back end of the transmit BUC module are two F connectors marked IFL (inter facility link cable) and AP (antenna pointing). There is a black cover on the AP connector. The IFL (inter facility link cable) is the one to be used for the transmit cable (To SATellite). The instruction manual 4096-689 for the 1.2m Ku band TX=TX Eutelsat NEC interface antenna feed system, needs to be read with care. Section 3, dealing with polarisation refers to Vertical and Horizontal polarisation - but omits to say that this refers to the transmit polarisation - which is unusual. If in doubt, think: The receive polarisation is defined by the pin inside the rectangular waveguide entering the LNB. If the broad faces of the LNB rectangular waveguide are on either side that is horizontal receive polarisation. This unit must be mounted on edge as shown using the base provided. If it is oriented horizontally it will overheat and damage. Put it in a safe place where is won't get knocked or pulled down by its cables. Secure the cables if possible but don't bend them sharply. The coax cables should not be attached to walls etc, using evenly spaced clips. Clips, if used ,should be randomly spaced and care taken to avoid crushing the cable at each clip. If you need to power it on or off use the mains switch, don't pull out the DC cable with the power on. Initially, prior to commissioning, you must connect a single PC directly. Once commissioned, the modem will have a different IP address and the modem may be used to connect a local area network with many PCs. The HX modem contains a web site called by entering http://192.168.0.1 into your browsers address bar. This web site has all kinds of information to help you. In particular there are four key buttons to click on: System Status, Reception Information, Transmission information, System Information. Each of these leads to much more detail, as required. Many users in Europe, the Middle East and Africa will self install. It is not difficult, but it does require that you carefully follow the instructions. If you have problems, call your service provider (Bentley Walker or WAFA) for advice. Read the http://www.satsig.net/bentley-walker/hn7000s/H7000S-HN7700S-Remote-Terminal-Installation-Guide.pdf ( Warning: this is a 9 Mbytes pdf file so may not be appropriate to download ) This installation guide refers to an earlier version of the modem, but much of the details still apply. You will need to send the PSN number on the back of your modem and your latitude and longitude and coax cable length to Bentley Walker or WAFA service provider. Prepare your PC by setting the Local Area network connection properties so that for TCP/IP it will Obtain an IP address automatically (DHCP). Also check that in Internet Explorer proxy server is turned off. Do Tools, Internet Options, Connections, LAN settings, make sure "Use proxy server for your LAN" is turned off, i.e. blank. Determine the latitude and longitude of your location using http://www.satsig.net/maps/lat-long-finder.htm Write down your latitude and longitude in degrees and minutes. e.g. Longitude 3 deg 12 minutes East and Latitude 40 deg 56 minutes North. It is important to join the DC power supply module to the modem with its multi way DC power cable before switching on at the AC mains supply. In reverse, you must turn off at the AC mains; never disconnect the DC cable between the modem and the power unit while the mains power is on. Initially leave the BUC transmit cable disconnected at the modem until all dish pointing is finished. Initially have only the LNB coax cable connected to the SAT IN connector. If you have a Horizon meter, connect it into the LNB cable now. At power on observe that all front panel LEDs light up for a moment, then the Power LED stays on, then the LAN LED comes on if your LAN cable and a PC are connected, and finally the Power LED starts to flash, indicating that the terminal is not yet commissioned. If not, try ipconfig /release, ipconfig /renew and ipconfig /help to try and resolve. Reboot the PC if necessary. Now try a ping to the modem at 192.168.0.1 If this succeeds you are now successfully communicating with the HX modem. You send a ping by typing ping 192.168.0 1 into a black command prompt DOS window. Now to configure the HX modem which means putting in the wanted downlink frequency etc. Access the HX Control Panel web site, which is inside the HX50 modem. Open up your web browser (e.g. Internet Explorer) and type in the url http://192.168.0.1/fs/registration/setup.html in the Address bar. Select Manual Commissioning and the form below should appear. Using the paper page of information provided to you by your service provider, type in all the entries exactly and then double check before clicking "save configuration" at the bottom. There is one anomaly. When your receive polarisation is nominal Horizontal your nominal transmit polarisation is Vertical. The displayed transmit polarisation may spontaneously change to a display showing Horizontal. Ignore this 'feature'. This is where you enter the satellite orbit location, configuration data, like frequency, symbol rate, your site latitude and longitude, LAN parameters etc. Once the above configuration information is saved, the modem will start trying to receive the outlink (download) carrier to you. Note that the satellite downlink carrier frequency is the L band cable frequency, as above, into the modem plus the LNB local oscillator frequency. The LNB local oscillator frequency is typically 9750 MHz, 10000 MHz or 10600 MHz depending on the type of LNB and the voltage or 22kHz tone applied. The modem tuning needs setting in 100kHz intervals, i.e. 12345 x 100kHz is the same as 1234.5 MHz. Point your dish at the satellite. To do this set the polarisation angle on the back of the dish (-90 to +90 deg) and set the elevation putting an inclinometer up/down against on the polarisation arrow < plate. 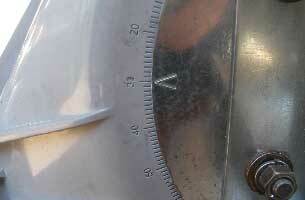 When using an inclinometer the scale may read backwards. Think, when the dish is pointed low down near the horizon the elevation angle is low, like 15 deg. When the dish is pointed high, the up elevation angle increase, ultimately to 90 deg. If you don't have an inclinometer, don't worry. There are two alternatives. 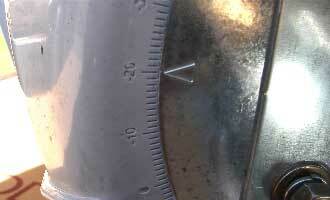 (2) measure the distance along the elevation screw. Using a home made inclinometer, beam elevation angle 48 deg, applied directly to the backing plate of the wedge shaped plastic boss. Once you have pre-set the elevation angle as best you can, swing the dish boldly around the general azimuth direction and your Horizon meter will say satellite found and the modem will show the signal quality. If you miss, go up and down slightly in 3mm steps, on the elevation screw and try again. Now peak up. This needs skill and care and time - it may take an hour. Do the azimuth first. One suggestion is to put the two nuts about 2 turns loose. Repeatedly swing the dish gently to rest against each nut and measure the low degraded quality on each side, either side of the beam peak. Adjust one nut till exactly the same poor quality is detected on each side. Then wind in both nuts by exactly the same number of turns and flats (1/6ths of a turn). The azimuth will then be in the exact centre. Now tighten down the large centre azimuth axis bolt. The dish elevation will rise up a little and you may lose the signal temporarily. Last, peak up the elevation. Wind the outer nut all the way through the beam peak, while counting the turns. Then wind back to the middle. In elevation the weight of the antenna will normally mean there is no backlash. Make sure now that all aspects of the antenna are tight. If final tightening causes a signal drop re-peak in azimuth and elevation. It may take anything from 1 hour to 1 week to find the satellite and peak up. You must get the peaking perfect as the transmit beam is narrower then the receive beam. Record your receive signal quality. The scale goes up to 100. Having finished the antenna, de-power the system using the indoor AC mains switch. Disconnect the Horizon meter (if used) and reconnect the LNB cable. Connect up the transmit cable also. Make sure no one interferes with this dish from this time. Now phone the hub and tell them you are ready to transmit. Tell them the signal quality factor you measured. They will say to turn the power on. Now leave alone for ten minutes while the hub commissions your site. It is important not to interrupt the process. You may watch some progress indications, such as download of the latest software files. After a few minutes your terminal will be ready for use. Your PC should have had DHCP enabled and it will have adapted to the new IP address of your modem, and subnet mask. In my case the modem's new IP address is 10.136.6.161 and the subnet mask is 255.255.255.240 If the last number of the subnet mask is 240 and means that you can have 13 IP devices connected. There are in fact 16 IP addresses involved. In this case the first IP address 10.136.6.160 is the subnet identity or name, written like 10.136.6.160/28 (where 28 is the number of masked bits). This name is what you might write on a network diagram against the line. The next IP, 10.136.6.161, is normally used for the gateway (the HX modem in this case) and there are a further 13 IP address available up to 10.136.6.174, for your devices. The final IP address 10.136.6.175 is a broadcast IP address and is not for a specific device. Read here for more details about subnet masks and IP address calculations. So, with a .240 subnet, you can connect up to 13 devices, using a passive hub or switch. You may of course insert a router and expand any of the IP addresses to your own invented private IP address space. You must limit the number of PCs to keep congestion down. Now access the web site inside the HX50 modem. Open up your web browser (e.g. Internet Explorer) and type your own specific gateway, in my case http://10.136.6.161 in the Address bar. You should see a screen that refreshes itself every 15 seconds. It shows the status with four important buttons at the top and provides links to various functions. I suggest you make this page one of your bookmarks / favourites. Normal web browsing: No problems. Upgraded Microsoft updates: About 150 Mbytes downloaded. This caused me to exceed 40 Mbyte, so I was then slowed down for a while, but within a couple of hours the 8 hour boundary occurred and the system was back to full speed again. Downloaded 7 Mbytes log file using ftp. Took 3 min 17 seconds, bit rate 355 kbit/s. Downloaded 7.5 Mbyte log file using ftp. Took 2 min 1 sec. bit rate 606 kbit/s. Upload 7.5 Mbytes using ftp: Took 7 min 77 sec, 154 kbit/s. The initial speed was about 400 - 300 kbit/s for perhaps 10 seconds, reducing to steady 160k after about a minute..
Downloaded 10 Mbytes: Started at 450kbit/s for a few seconds, then down to 356 kbit/s steady for 4m 43 sec. Overall 355 kbit/s. Downloaded 7.2Mbytes: 354 kbit/s 202 sec. Downloaded a Youtube video and sound (Beatles: and I love her) and 5.6 Mbytes file simultaneously. The ftp download was slowed to 175kbit/s. The video was also about 1/2 speed (3 sec music, 3 sec silence) so it seems this music needed 350kbit/s. Downloaded 8.1 Mbytes 605kbit/s (at 00:11 am Sunday). Monday morning 9:30am Downloaded 4.9 and 8.2 Mbytes 256 and 354 kbit/s. 15 Nov. download: 6.6 Mbytes 355 kbit/s. 17: Nov Downloaded 10 Mbytes. 355 kbit/s. Downloaded 4.9 Mbyte pdf file from Codan - slow ? 19 Nov: Downloaded 22 Mbytes ftp 356 kbit/s. Downloaded 18 Mbytes zip file around 500k initially, then gradually downwards to 384 kbit/s. 20 Nov Downloaded 12 Mbytes. 612 kbit/s. 26 Nov Downloaded 10 Mbytes at about 9:30 am speed 305 kbit/s. 10 Mbytes at about 13:00 am speed 302 kbit/s. This system is evolving to best share out the available capacity. According to the tariff you have chosen you have various thresholds per 8 hour period. 15 - 297 Mbytes uploaded when speed is reduced to 30 - 45 kbit/s. 45 - 2200 Mbytes downloaded when speed is reduced to 64 - 256 kbit/s. Every 8 hours you start again and go back to full speed. Your normal full speeds, the traffic quantities and the reduced speeds are associated with each particular tariff, so you get your fair share, corresponding to what you are paying for. Download max 512k, typical 256k. 30 GBytes per month. Upload max 128k, typical 30k suitable for 1 - 3 PCs. Both back to Fast speed every 8 hours.